How was your Christmas? I hope you ate well, laughed lots, and hit your desired balance between fun and rest, food and activity. We returned yesterday from our four days in Cumbria, England's Lake District region and a particularly beautiful part of the country. It was very different to a hot Australian Christmas! 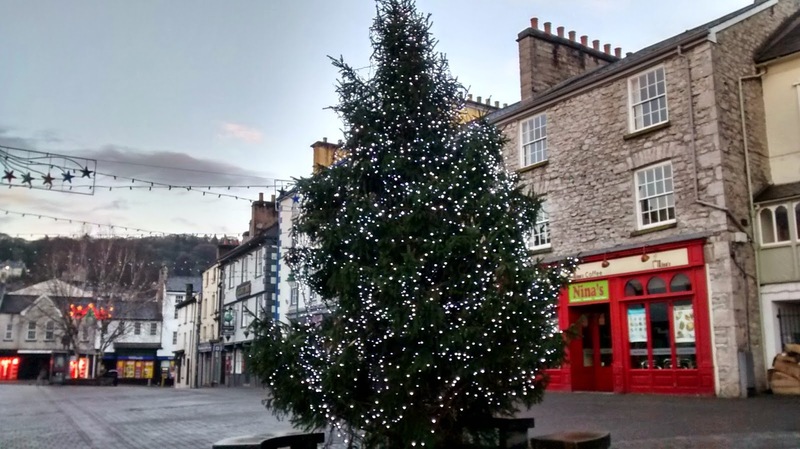 Our base was in Kendal, the largest town in the region and just on the edge of the Lake District National Park. I had no memories of the town and was surprised at how attractive it was, as well as how large. 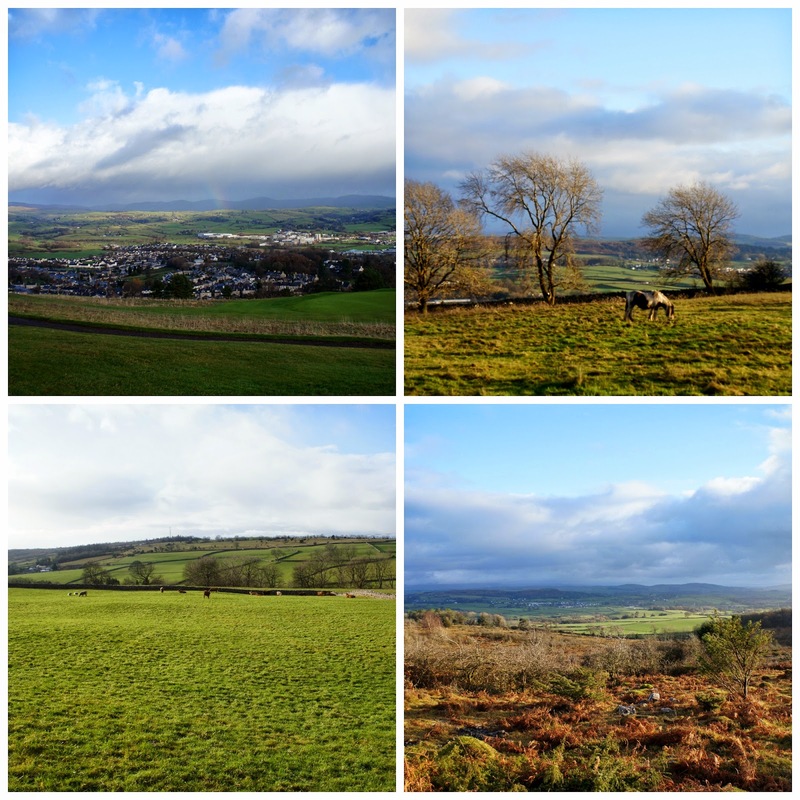 Our holiday cottage was nicely located for the town centre and plenty of countryside walks. You may remember my worry about organising food for this trip. As we travelled by train, we needed to carry everything by hand and also keep cold things cold. A suitcase half dedicated to food helped with the former, while a cool bag and carefully chosen foods helped with the latter. I also recognised quite early on that life would be easier if I bought most things rather than made dishes from scratch. For dinner on Christmas Eve, we had a sundried tomato orzo pasta salad and carrot, buckwheat and chickpea salad from Marks and Spencer (both vegan and pictured in poor lighting above), together with some green salad, wraps and hoummus. The green salad, wraps and hoummus did double duty for Christmas Day lunch, which was quite unconventional as we ate it in the middle of a 4 hour hike. It was a lovely way to spend the day, and fortunately we had mostly fine weather and above freezing temperatures. In addition to salad and hoummus wraps, we had a generous assortment of snacks for the walk, as fitting for Christmas Day. They included Kendal mint cake, the sugary confection that has fueled climbs of Mount Everest as well as more modest pursuits. The walk itself took in a range of terrains and views, and every one of them was stunning. I would have been taking photos constantly if I wasn't also trying to keep my hands warm inside my gloves! Even with that constraint, I had my camera out quite regularly. Our main Christmas meal came in the evening, when our appetites were whetted from walking. When planning it, I had to take into account that we wouldn't have a proper oven, as the place we stayed had a combined microwave oven - not at all the same thing. 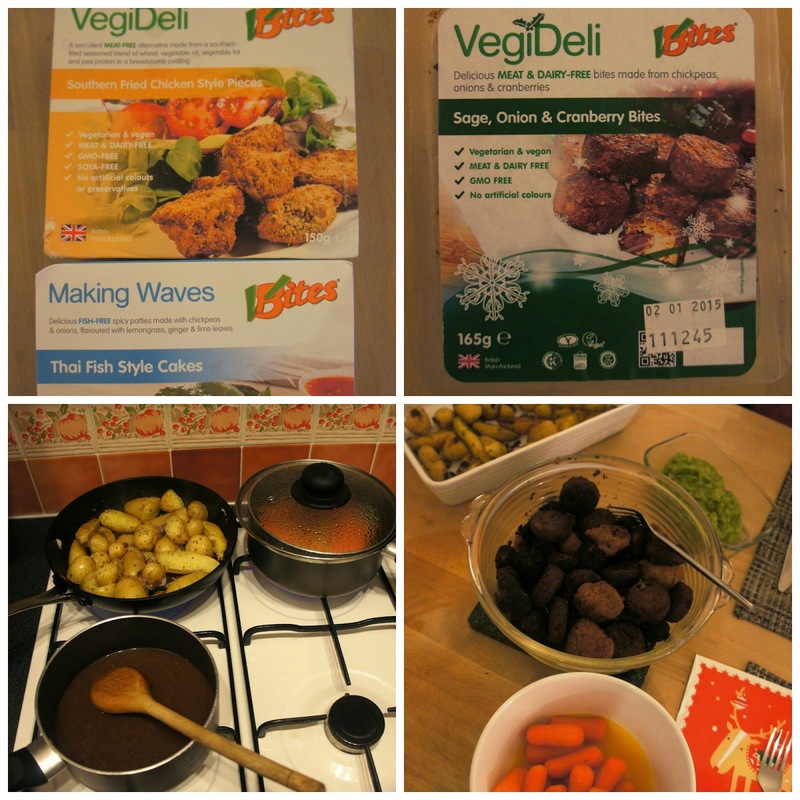 I ended up buying a selection of VegiDeli products that I cooked on the oven setting of the microwave and crisped up in a pan at the last minute. They included vegan Thai 'fish' cakes, southern 'chicken' style pieces, and sage, onion and cranberry bites. We liked them all, especially with mango chutney, which I carefully carried north as an alternative to cranberry sauce. Rounding out the VegiDeli items, we had baby carrots cooked in the juice of one orange and a tablespoon of honey; mushy peas; and baby potatoes cooked half in the microwave until softened, and half on the stove top with olive oil, onion, oregano and salt to give a crispy roast-like finish. Before the main meal we started with a Waitrose French onion and red wine soup. Mr Bite's desserts revolved around mince pies and a chocolate bombe pudding, whilst I enjoyed plum bread (a bit like fruit bread crossed with plumb cake) and soy custard together with berries. As with all good Christmas meals, we had enough leftovers to take care of Boxing Day lunch and the items were equally enjoyable reheated. It was an unusual Christmas Dinner, but managed to feel Christmassy and special without much active preparation time required. Our other days in the area were spent similarly, with a good mix of walking, relaxing and eating. We enjoyed a day in Windermere on Saturday, where snow topped mountains provided the perfect backdrop to the small town and lake below. 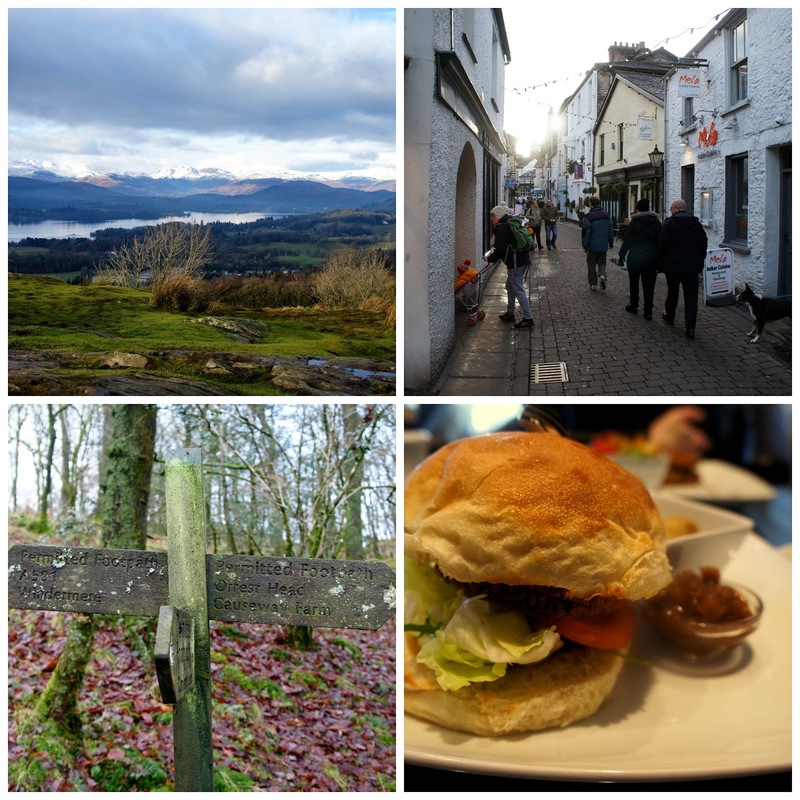 Bowness-on-Windermere town, veggie burger lunch, walk trails. We ate lunch that day in the simply named #4 cafe, so titled for its location at 4 Grosvenor Terrace, just off the main high street. The menu had several appealing vegetarian soups, but unfortunately they had run out of them when we went to place our orders. I changed to a veggie burger instead (minus dairy components), which delivered on taste and was impressively sized. Mr Bite also liked his tuna ciabatta, and I loved my mulled spiced chai tea. It was a short period away, but a thoroughly enjoyable one...and the trip home was all the easier for half of my suitcase no longer being weighed down by food! I did have fun choosing, even if there was an element of stress in the planning too - all worth it in the end! We missed the heaviest snow but with temperatures below freezing in London, it does seem feasible there will be more down here (although probably not this week because it will be a warm 10'C on Friday!). Hi Kari, I did have a lovely Christmas with my family, thanks. Your photos of your travels in the Lakes District are gorgeous. I have tried Kendal mint cake - I went to Kendal on a bus tour years ago. Happy New Year! I'm glad you had a good day - and that you've tasted Kendal mint cake! It is a great, albeit very sugary, product. Sounds like a lovely (and delicious!) Christmas!! Thanks Joanne - it was! Your Christmas sounds just lovely! Plenty of fresh air, gorgeous scenery and delicious food. There is a definite advantage to cooking and eating traditional Christmas fare in the colder weather! By the way, do you make or buy your soy custard? Thanks Lisa - it was a great week :) As for the soy custard, I've only recently discovered I like it! I've been buying the vegan Alpro brand here but now I am a convert I'd like to try making my own. I don't know if my tastes for custard changed or I just like the soy stuff more, but I never really liked it as a child. I love The Lakes and we were just discussing over Christmas that next year it would be a great idea to pack up and all hire a holiday cottage up there. You sound to have had a fantastic time, just a tad jealous!